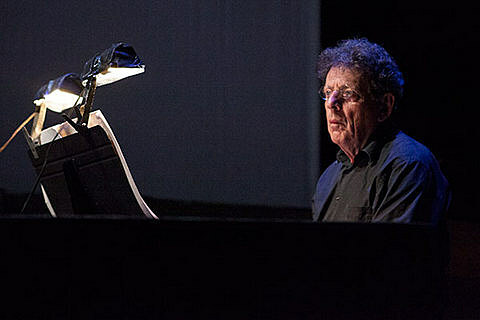 Artistic and composer Philip Glass has had a busy year, between curating the star-studded lineup for the 25th Annual Tibet House benefit and publishing his memoir, Words Without Music. Now nearing the half-century mark in his prolific career, the 78-year-old is teaming up with a personality from his early days — seasoned sculptor Richard Serra. The two worked closely in 1960s Paris, with Glass serving as Serra’s assistant. Serra’s gargantuan Richard Serra: Equal installation is on view now through July 24 at the West Side’s David Zwirner Gallery, home to frequent Instagram-fodder and thoroughly enjoyable modern art. Specifically: Philip Glass will join violinist Tim Fain for a special concert happening June 27 at David Zwirner Gallery, played inside Richard Serra: Equal‘s collection of 40-ton steel cubes. Proceeds from the concert will go towards helping House With Heart, a Nepali shelter for abandoned children, that was damaged in the earthquake last April. Tickets for the benefit concert run from $300 to $1,000. In other news, filmmaker John Walter is working on a documentary about Glass and Robert Wilson‘s acclaimed opera, Einstein on the Beach. Titled The Earth Moves, it’s currently seeking funding via Kickstarter and The Nowness just premiered a five-minute segment that you can watch below. Also: The Musical World of Harmonium Mountain: Clifford Ross & The Orchestra of St. Luke’s happens at Celebrate Brooklyn‘s Prospect Park Bandshell on July 30. It’s a “massive, site-specific, multi-screen installation with a varied and transportive suite of live music” featuring the works of Vivaldi, Steve Reich, John Adams, Bryce Dessner, and Wojciech Kilar, and more. To open the evening, cellist Jeffrey Zeigler of the Kronos Quartet will team with percussionist Andy Akiho and poet Rober Bonair-Agard for a program of Philip Glass, John Zorn, and Paola Prestini. That event is free and open to the public.